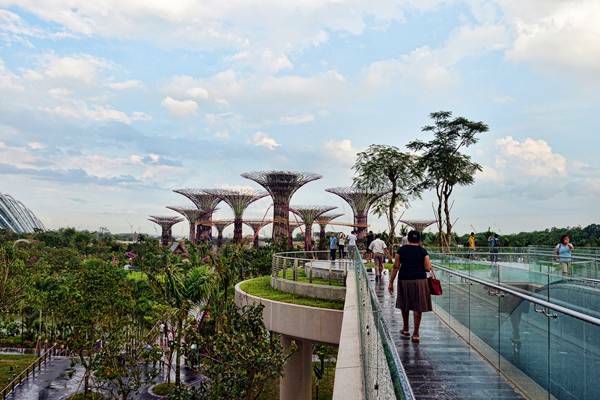 As part of Singapore’s redevelopment and new downtown area at Marina Bay, the sprawling 250-acre Gardens by the Bay is an incredible public space with gardens, bridges, skywalks, parks and plants. 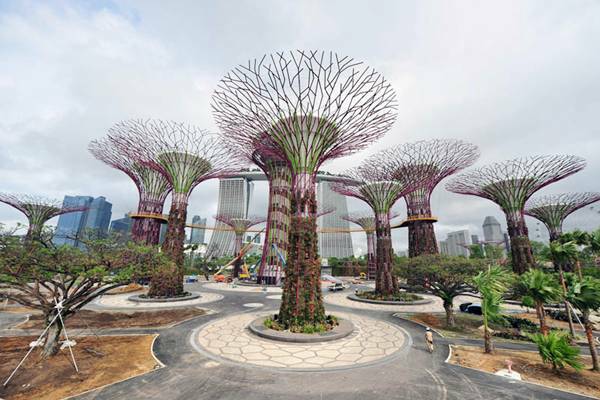 The green development has been proclaimed a ‘horticultural heaven’. 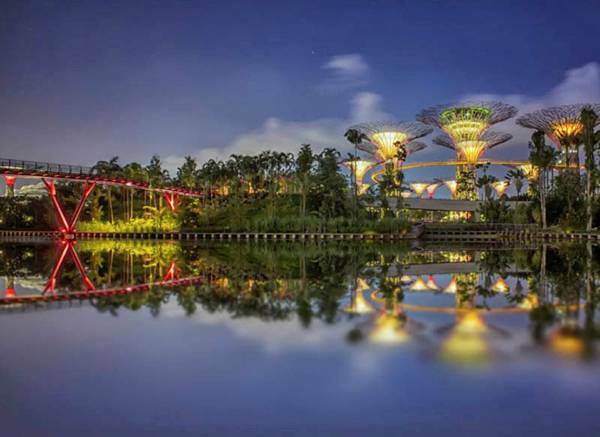 The attractions garnering the most buzz are the two massive climate-controlled biomes called Cloud Forest and Flower Dome and of course the massive man-made supertrees . The biomes are equivalent in size to about four football fields and will become the new home for approximately 220,000 plants from ever continent on our planet. An interesting feature of the Flower Dome is that the horticultural waste will feed a massive steam turbine that in turn generates electricity that is needed to keep the biome climate-controlled. 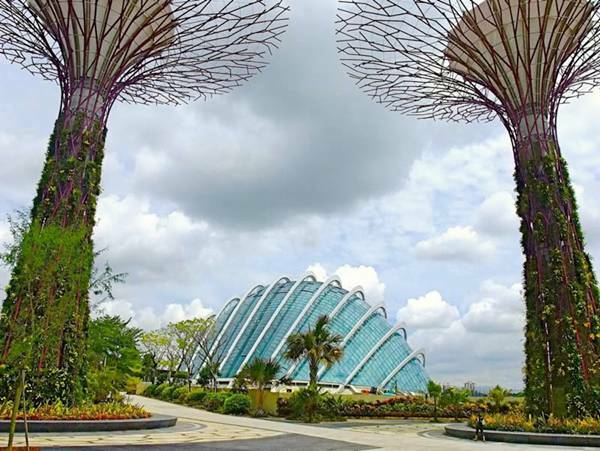 The two biomes are the only areas of the Gardens by the Bay where an admission fee will be charged. 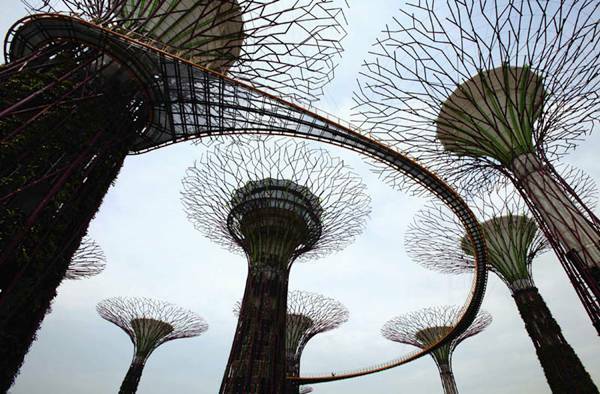 As for the man-made supertrees, check out the gallery below (a mix of photographs and renderings) along with a detailed overview of these fascinating structures. 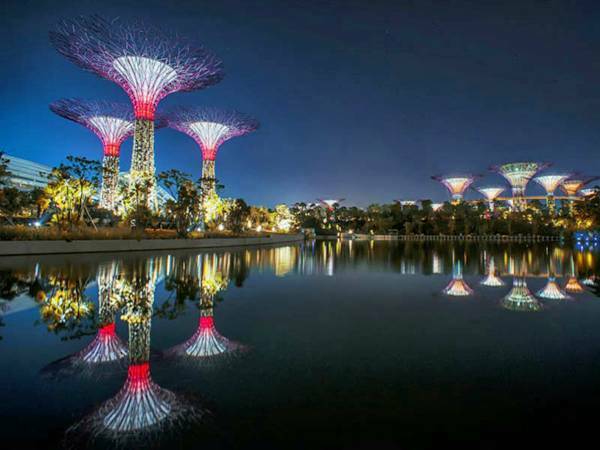 Gardens of the Bay is set to open to the public on June 29th. 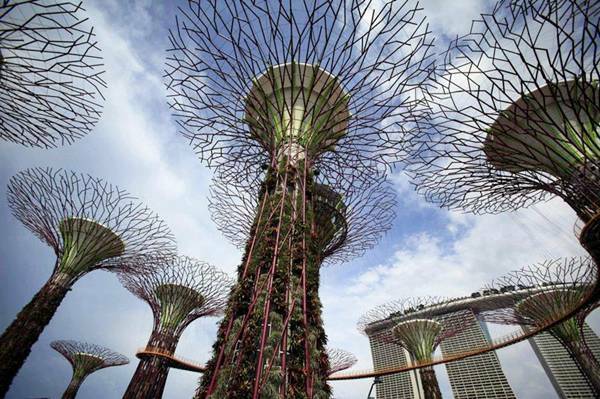 There are a total of 18 supertrees varying from 25-50 meters in height (82-164 ft). 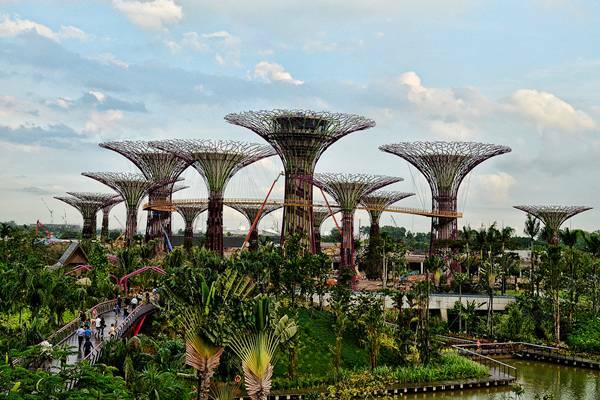 Bridges and skywalks (128 m/420 ft long and 22 m/72 ft high) will connect the taller supertrees, giving visitors incredible views of the Gardens by the Bay development below. 11 of the trees have solar photovoltaic systems to convert sunlight into energy. The solar energy collected during the day is used to light the structures at night. 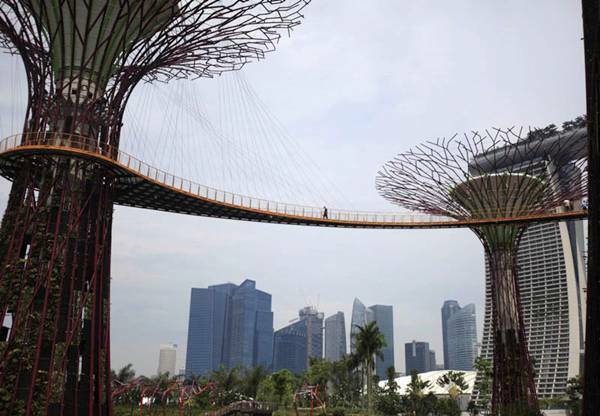 Each supertree feature tropical flowers and a variety of ferns that rise up the steel framework. The canopies serve as temperature moderators, absorbing and dispersing heat and providing shelter to those beneath. The trees also serve as rainwater catchers. 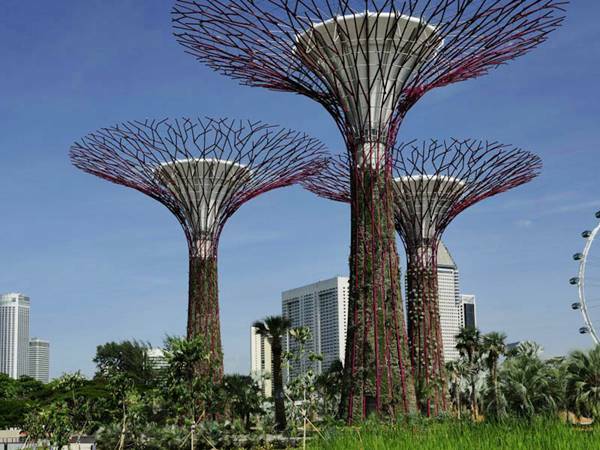 The supertrees will consist of nearly 163,000 plants of over 200 species. 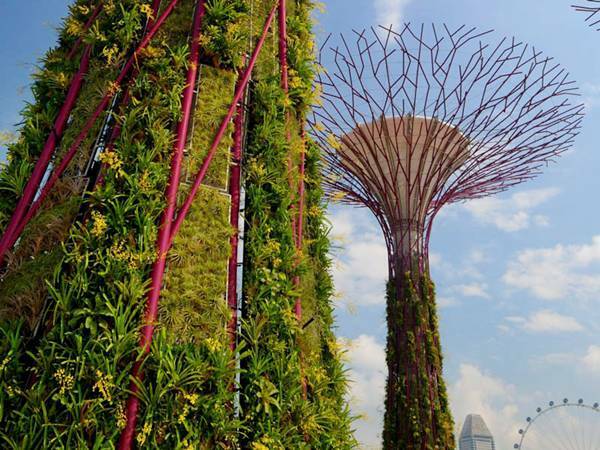 Each tree has a concrete core, a steel trunk fitted with planting panels and a canopy at the top lifted by a hydraulic jack system. Designed by U.K. architecture firm Grant Associates.